A few companies out there offer no-deposit insurance coverage with low premiums, but you will need to shop around to find the best rates. In most cases, you can get a quote online and compare quotes from different car insurance providers. Insurify gives you real-time auto insurance quotes from top-rated national and regional insurance companies. Just take two minutes to fill out your driver info, and you might unlock savings and discounts in an instant! 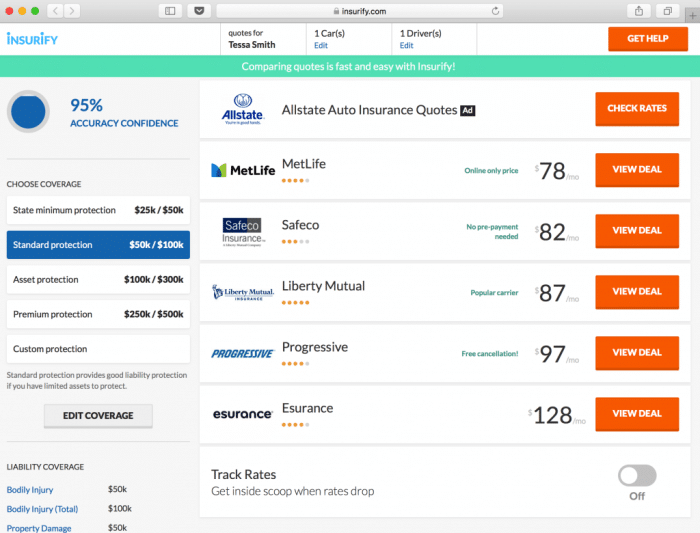 Insurify empowers you to perform auto insurance quotes comparison all in one streamlined platform, and save money on your car insurance policy to boot. Instant car insurance savings are within reach! Without Insurify, a quick Google search for “very cheap car insurance no deposit” and the like will show you hundreds of companies offering car insurance without a down payment requirement…but there’s a catch. Here’s what you need to know about “cheap car insurance no deposit” offers. Is No-Deposit Car Insurance Right for You? You may be wondering how cheap, no-deposit auto insurance plans are different from standard insurance plans. One of the biggest reasons why people apply for this type of insurance coverage is because there’s no down payment requirement and coverage starts as soon as the first month’s premium installment is paid. If you need immediate car coverage and don’t have money available to cover the deposit, you don’t have to go without car insurance. It’s important to remember that driving without auto insurance is illegal in most states, and you could end up paying hundreds and thousands of dollars out of pocket if you’re involved in an accident as an uninsured driver. Your insurance rates, as a result, will skyrocket. In addition, having a lapse in coverage can prevent you from getting car insurance coverage in the future. Insurance companies always look at your history of maintaining coverage, so if you ended up with a lapse in coverage—even if you didn’t have a vehicle or weren’t driving it for that period of time—it will reflect negatively on your record. It’s important to take extra steps to prevent this from happening whenever possible. Even if you’re low on cash, getting cheap car insurance with no deposit will at least give you the coverage you need. Monthly payment plans. Many companies offer an annual premium, so you might have to calculate the monthly premium payment, including any other fees and charges. If you don’t pay the annual premium in full or choose a payment plan, you might need to pay extra each month. Shopping for auto insurance on Insurify will allow you to compare between monthly car insurance quotes for both annual and six-month policy periods. Customer support. Newer companies offering cheap car insurance with a no-deposit policy may not have a good track record of customer support yet or have lower ratings. Make sure you can verify a dedicated customer support phone number and find out if anybody has posted any reviews about the company. In the event you needed to file a claim, you would need access to a reliable customer support team to help with the paperwork. Company history. There are a lot of insurance scams out there, so you want to make sure the company you choose for your cheap car insurance with no deposit has a good track record. Check online reviews and verify the company’s status with the BBB and other organizations. Once you’ve done your due diligence to find the best company that offers cheap car insurance with no deposit, you’ll want to make sure you don’t end up paying extra fees and charges in exchange for getting a great rate. For many people, this type of insurance is the best option because it’s affordable. If you’re on a tight budget and are unable to pay your annual car insurance premium as a lump sum payment, you can break up your premium into monthly payments and still drive without being uninsured. However, it’s important to understand why an insurance company would offer this type of plan. In some cases, you’re not legally insured if you have this type of “coverage,” so you need to verify the company you are working with is real and has a positive track record. Even if they do, be prepared when you get the bill. Since you are considered to be a higher risk customer—you can’t pay a deposit, so you don’t have any “stakes” in the plan besides your monthly installment—the insurance company will usually charge a higher-than-average premium. This means you could end up paying hundreds of dollars more than the average over the course of the year because you didn’t pay a deposit or down payment. Still, there are some ways around this. Even though there is no deposit required in this case, paying a down payment can lower the cost of your monthly installments significantly. If you want to maintain continuous coverage and have some room in your budget, this can be a convenient way to get the coverage you need and pay less than the average for your premium every month. You can even set up direct payments from a checking account. Some companies may offer a discount for direct debit payments made on the same day every month; this can help you save more on car insurance over time. The insurance company may also take other things into account, like the neighborhood you live in, whether the vehicle is parked in a garage or on the street most of the time, how often you drive the car, and who else might be driving the car. If you’re willing to pay a deposit, you can work with regular insurance carriers and show them your driving record and clean credit history to qualify for an attractive rate. Other companies may also offer auto insurance discounts, such as a good driver discount, a discount for going paperless, a multi-vehicle discount, and a discount if your car has advanced safety features and devices. In some cases, you may even qualify for a discount if you park the vehicle in a garage. Keep these in mind as you start shopping around. Be wary of offers for “no down payment auto insurance” and “no deposit auto insurance” because the companies behind them may not have a good reputation. If you do find a reputable company, make sure you’re aware of all the terms of the agreement and are getting a good deal even though you’re not paying a deposit. In some cases, paying the higher monthly premium offsets any savings you might accrue by paying the money upfront…so you might be better off working with a regular car insurance company that offers more benefits and options. Don’t forget to search for and compare the best car insurance quotes with Insurify. Free quotes, major savings, and simple payment processes all on one site! What could be better?